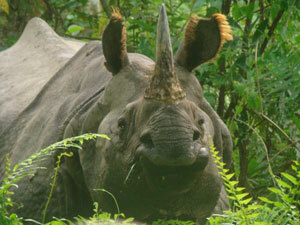 The Chitwan National Park is home to at least 43 species of mammals. The "King of the Jungle" is the Bengal Tiger. The alluvial floodplain habitat of the Terai is one of the best tiger habitats anywhere in the world. Since the establishment of Chitwan National Park the initially small population of about 25 individuals has increased to 70–110 in 1980. In some years this population has declined due to poaching and floods. In a long-term study carried out from 1995–2002 tiger researchers identified a relative abundance of 82 breeding tigers and a density of 6 females per 100 km2. Leopards are most prevalent on the peripheries of the park. They co-exist with tigers, but being socially subordinate are not common in prime tiger habitat. In 1988, a clouded leopard was captured and radio-collared outside the protected area, and released into the park but did not stay. Other felids reported from the protected area comprise fishing cat, jungle cat, leopard cat, and the rare marbled cat. Chitwan is considered to have the highest population density of sloth bears with an estimated 200 to 250 individuals. Smooth-coated otters inhabit the numerous creeks and rivulets. Golden jackals are common. Bengal foxes, Spotted linsangs, palm civets, Large and Small civets, several species of mongoose, honey badgers and yellow-throated martens roam the jungle for prey. wild dogs are rare. Striped hyenas prevail on the southern slopes of the Churia Hills. Rhinoceros: since 1973 the population has recovered well and increased to 544 animals around the turn of the century. To ensure the survival of the endangered species in case of epidemics animals are translocated annually from Chitwan to the Bardia National Park and the Sukla Phanta Wildlife Reserve since 1986. However, the population has repeatedly been jeopardized by poaching: in 2002 alone, poachers have killed 37 animals cruelly in order to saw off and sell their valuable horns. From time to time wild elephant bulls find their way from Valmiki National Park into the valleys of the park, apparently in search of elephant cows willing to be seduced. Gaurs spend most of the year in the less accessible Churia Hills in the south of the national park. But when the bush fires ease off in springtime and lush grasses start growing up again, they descend into the grassland and riverine forests to graze and browse. The Chitwan population of the world's largest wild cattle species has increased from 188 to 296 animals in the years 1997 to 2007. Especially the park's alluvial grasslands are important habitats for the critically endangered Bengal florican, the vulnerable lesser adjutant, grey-crowned prinia, swamp francolin and several species of grass warblers. In 2005 more than 200 slender-billed babblers were sighted in 3 different grassland types. The near threatened Oriental darter is a resident breeder around the many lakes, where also egrets, bitterns, storks and kingfisher abound. The park is one of the few known breeding sites of the globally threatened spotted eagle. Peafowl and jungle fowl scratch their living on the forest floor. © by Travellers Jungle Camp, 2018, all rights reserved.